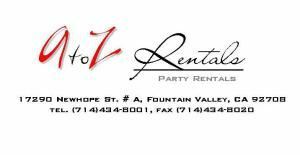 Whether you are planning "the party of the century," or just a small get-together, the staff at A to Z Party Rentals is ready to help you sort your thoughts. From table and chair rentals to tent and canopy rental, (and everything in between, including dance floors, china, flatware, linens, and bars) we've got it! Not only do we have a great variety of equipment available, our party planning consultants are more than happy to help you plan your event, right down to the last detail.